Discover your passion for Scooter / Mobility solution and High End Battery solutions. Experience fascination in diversity as well as success with optimised processes and innovative concepts at EMG. 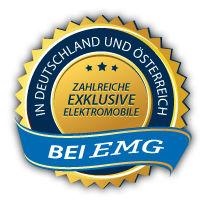 EMG Elektromobile - founded in 2002- is one of the leading group of High Quality Scooter / Mobility and High End Gel Battery solutions in Germany and Central Europe. EMG guarantees dealers an international reliable support and service around the clock. All Scooter solutions and more than 10,000 AGM + Gel batteries are available ex works within 24 hours. Whatever you need, we will support you within short period of time. The correct product at correct time and place - EMG guarantees you an European Service. Do not settle for less. Netherlands, Belgium, France, Czech Republic, Poland, Denmark, Spain, Italy, Bulgaria, Croatia, Estonia, Finland, Greece, Hungary, Portugal, Slovakia and Slovenia.